' Vernon Corea, Livy Wijemanne and Jimmy Barucha were instrumental in highlighting my first song " Kiss Kiss Kiss " on Radio in Sri Lanka.The song was recorded with Mary Marshall and a group I formed called the Kandyans. All Sri Lankans, the group consisted of Mano Chanmugam, Percy de Silva and Anura.The producer of the record was Dennis Preston who later had that great number one hit with Acker Bilk " Stranger on the Shore" . 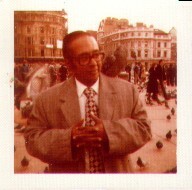 He became the hero of the fifties and sixties British Traditional Jazz revival. It was Vernon who picked up on the publicity and when I came back to Sri Lanka the song was already making waves on Radio Ceylon of the time. of Truth" ...and had children participate in the various parts on the program. second episode on Friday, June 14, 1963.
time for everyone to listen. not be going quite right. consider the Kiddie's Korner show with Vernon. Studio 6, that evening. The studio audience was packed to the brim. Favourites From the Friend of the Family." 1. Be in your seat by 7:15 p.m.
5. 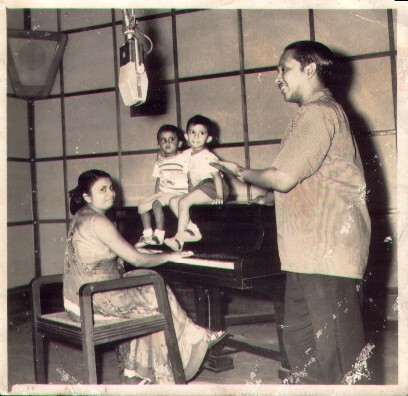 The show is on 6 JUL 1963 at 7:30 p.m. at Radio Ceylon Studio 6.
and other Sri Lankan goodies). eyes, even today--thirty-eight years later. I have so many special memories of dear Vernon but I suppose the one that will stand out the most and linger the longest was our first meeting in the Renuka Hotel (on Galle Rd.) when we started working out the details for the contract between SLBC and TWR. We were alone in my room and your Dad said, "Mr. Mial, I want you to know that I am a believer in Jesus Christ !!" Needless to say, this was the last thing I had expected to hear from an "offical" at SLBC. That started a spiritual bonding process between Vernon and me as we prayed together and asked our Lord to guide us in working out the agreement. Well, needless to say, I could go on and on. Your Dad and I met several times after you all moved to the UK and I think perhaps the last time I saw he and your Mom was when they visited TWR in Chatham, New Jersey. Wonderful memories of a wonderful brother in Christ.